Total contact parts are of S.S. – 316, and other surface parts are of S.S.-304. Manufactured with latest technology – digital electronic frequency AC drive based machine. Automatic sensor based bottle counter system. 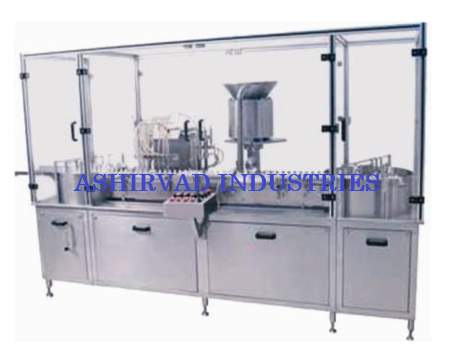 Production Speed 120 to 240 Vials / Minute. Container Diameter 15 mm to 70 mm. Container Height 25 mm to 140 mm. Rubber Stopper 13mm, 20mm & 28mm Butyl with the help of change parts.